Commonly referred to as the money plant or money tree by feng shui practitioners, the botanical name of this lovely plant is Pachira or Pachira Aquatica. A sturdy plant, growers often train the Pachira as a type of bonsai tree. Money plants range in height from several inches to six to seven feet. A large money plant often has a foliage width spanning more than three feet. Whether you allow it to grow tall or keep it as a bonsai plant, caring for a money tree plant is relatively easy. Once you have it potted, you need to provide proper light, water and fertilizer to ensure it remains healthy. If you choose to allow your money tree to grow to full height, you need to plant it in a large flowerpot or container providing it with a lot of room to grow. Repot the money tree into a larger container when needed. By planting the money tree in a large pot in the beginning, you eliminate the need for frequent repotting. If you are going to train your money plant as a bonsai tree, the container needs to be very small. Money tree plants prefer a medium amount of light. You can place your plant where it receives indirect sunlight. If setting outside, then select an area that provides partial shade. Over watering is a common mistake made in caring for money trees. You only need to water the plant once every seven to eight days. Only add enough water so the soil is moist. Use a spray bottle to water the plant leaves lightly or to foliar feed your plant. If your plant is large, use a liquid fertilizer every other time you water. mall bonsai trees generally don't require frequent fertilizing. Limit fertilizer applications to the spring and fall. As the plant grows taller, follow the braiding pattern whenever the plant has enough new growth. If new branch growth is in the way of braiding, prune the branches and continue the braiding pattern. The branches do grow back over time. If the leaves of the money plant are turning yellow and appear droopy, it is a sign of over watering. If the leaves are curled up and wrinkly, it is a sign that the money plant is not getting enough water. Money plants can tolerate several hours of direct sunlight but don't allow your plant to get too hot. Add small pebbles or gravel to the potting soil to facilitate drainage. You'll need to bring an outdoor plant inside whenever the temperature drops below 50 degrees Fahrenheit. At some point, your money tree will outgrow its pot and possibly become root bound and needs to be repotted. The right pot will determine the size of your plant. Smaller pots will stunt the growth of your money tree while larger ones will encourage the root system and plant to grow. You need a pot with a drain hole to allow the soil to drain properly. Trapped water will cause root rot in your plant. The larger your pot, the larger your plant will grow. You can double the size of your pot when repotting a larger money tree plant. For a bonsai money tree, select a pot that is about two or three inches larger in diameter than the current container. This size limitation will slow down the money tree's growth rate. You can repot this plant twice a year. A money tree thrives best in soil that is slightly dry and has good drainage. The best potting soil for a money tree is a loamy composition, such as a peat-moss based soil. If you're a gardener and prefer to mix your own soil, then start with a balanced mixture of peat moss, sand (builder's sand) and include a little vermiculite for added drainage. Use a potting soil, or other rich soil, that contains a large amount of pearlite also helps with drainage and will retain moisture. A good choice of soil is medium cactus soil or potting soil with river sand added. Make sure the drainage hole in the new pot or container is clear. 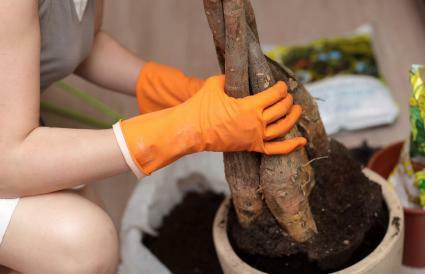 Place a couple of pebbles or other non-porous objects in the bottom of the pot to help prevent the potting soil from clogging the hole and encourage water drainage. Add two inches of potting soil to the pot. At the base of the plant, place your index finger on the outside of the plant stem along the soil line and your middle Place your index and middle finger on either side of the plant, so the base of the plant is secured between your two fingers. For larger plants, you'll need to use your thumb and forefinger to grasp the plant stem (trunk). Extremely large trunks may require using both hands to remove the plant from the pot. Keeping your fingers around the plant base, turn the pot upside down over newspaper or a small tarp. Dirt will tumble from the pot and will be caught by the newspaper or tarp. Once the plant is free of the pot, carefully set it into the new pot. Using a scooper, slowly fill the pot around the plant, stopping to press the soil down around the plant with your fingers. Leave about one-half inch to an inch of the pot rim exposed above the soil line. Minimize potential transplant shock by watering the plant and placing it in a warm spot. Your plant should recover from any possible transplant shock within three days. Continue to care and maintain your plant as usual. 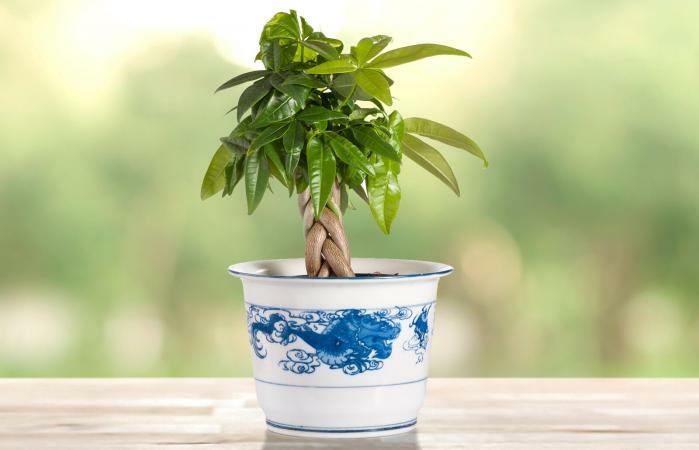 To grow a healthy feng shui money tree, you must take care that you don't over water the plant. Give your tree a bit of attention each day, and it should grow and thrive.